Welcome to Waterside. This stylish modern riverside home offers great accommodation and is located just yards from the waters edge giving superb views. Just imagine waking up and strolling along the river bank to the local baker to collect your freshly baked bread or bacon bites for breakfast and enjoying them outside sitting on the balcony overlooking the river in the morning sunshine. Later, perhaps explore the beautiful woodland on foot or take a cycle ride along the famous Camel trail right outside the door towards Padstow and the sea. Travel the other way along the river bank and you could enjoy a glass of fizz at Camel Valley winery. Or you could have a relaxed time looking round the shops which are nearly all independent. Or perhaps visit the some of the film locations of Poldark? Or head to the beach? Come back for a cup of tea in the sunny enclosed patio garden. Finish the day with a meal prepared from locally sourced ingredients or relax and enjoy a meal out in one of the many great eateries in the town or nearby. Waterside has been extensively refurbished for 2019 and is well equipped with free Wi-fi, a Smart TV, DVD, Ipod docking station, CD player and Radio. Plenty of space for a Couple, family or 2 couples it is an ideal place to stay. There is an ensuite shower room to the main double bedroom, a further double room with river views which can be made up for you as a twin or Super King Size (Zip and link beds) and a single room with garden views. There is an additional bathroom with bath and shower. There is a dedicated parking space. See details on the facilities tab for further information on layout. PLEASE NOTE THAT SUNDAY IS OUR NORMAL CHANGEOVER DAY FROM Easter until end of September. (This makes for a much more relaxed journey for you!) At other times of the year other changeover days are more flexible; please ask the owner. I have been renting Waterside as a holiday home for over 20 years with many repeat bookings. Previous to that I lived there myself for 2 years and my family love staying there occasionally, so it is well equipped, well maintained and should provide you with a great home from home. We look forward to accommodating you in wonderful Cornwall! I bought the property because of its fantastic views. Overlooking the playing fields and river is a relaxing experience and you can often spot the swans and sometimes if you are lucky a Kingfisher and other birds. I love eating lunch out in the sheltered garden. A Cornish Pasty or local Panini always goes down well! Even in winter the patio garden with palms is often warm and sunny. Wadebridge has 1742 hours of sunshine a year; 370 more than the UK average. Why not come and spend some extra hours in the sunshine? It is easily accessible from the A30 and is perfect for exploring Cornwall. Locally, Wadebridge has great amenities whilst the property is located a very short level walk away from them at the edge of town. Also, the Camel Trail woodlands and the river to the sea can be immediately enjoyed. The property is perfectly placed for exploring Cornwall. There is a good variety of cafes, restaurants and pubs in the area if you fancy eating out. There is an excellent delicatessen and also bakers and supermarkets. If you want to BBQ, cook a meal or have a picnic these are all easy and fun! The location of Waterside is just fantastic. Many of our customers come back year after year. Why not come and try it with your friends and family and enjoy it too? En-suite bathroom to bedroom 1 with shower, WC and basin. Heated towel rail. Main bathroom downstairs has bath with full height shower over, WC and basin. Shaver socket. Efficient night storage heating with instant boost facility in key rooms. Duvets and linen provided for all beds Towels provided as an extra at £3 per set (one bath and one hand towel). Please request when booking. Located in separate Laundry Room. There is also a separate hall area with ample space for coats and shoes. Tumble Dryer located in laundry room off hall, Clothes rack and outside laundry line provided. Also Iron and ironing board. Dedicated parking space and additional free visitor parking available may also be available adjacent to Waterside or along the river front. Free wi-fi accessible by your own personal device or through the smart TV provided. 2 USB charging points in Kitchen. Waterside has a large lounge upstairs to enjoy the wonderful views. Relax in comfort on the leather Sofas. Free Wi-Fi, Smart TV, DVD player, CD/Cassette Player, Radio, IPOD docking station, books, films and music are all provided for you to enjoy. Combined Fridge Freezer with enough space for a self catering week. Ceramic cooker with double oven and internal grill. A double oven with grill and ceramic hob. Oven gloves provided. The kitchen/dining room is very well equipped including a fridge/freezer, ceramic hob cooker, dishwasher, microwave, kettle, toaster, blender, radio and ample crockery, cutlery and cooking utensils. 6 chairs and a table provided. Integral unit which has Radio and plays CDs and Cassettes. Good selection of CDs provided. A selection of books are provided for use during your stay. Cards, Jigsaws and Dominoes provided. Small selection of DVDs available or feel free to bring your own to play. Patio garden. Includes garden furniture, gas barbecue and Tropical Palms. This enjoys sunshine from mid morning and is a regular a sun trap to enjoy whilst eating lunch; even in winter! Safe balcony overlooking the River Camel accessible from the Lounge. There is also a garden table and chairs to enjoy breakfast or watch the cricket when in play in the park opposite! Available at Playing Fields Opposite for an additional fee. St Enodoc, Rock - 18 Holes - 7 Miles (all distances approximate) St Kew Golf Club, St Kew Highway - 18 Holes - 10 Miles Treloy Newquay - 9 Holes - 12 Miles Trevose Golf Club can offer an 18 hole Championship course, a full length 9 hole course and short academy 9 hole course. - 8 Miles Merlin Golf Course is located above Mawgan Porth Bay, between Newquay and Padstow. Merlin Golf Course is an 18 hole heathland course with views of coast and countryside, and has the advantage of being an easy walking course - 10 Miles. Notes on accommodation: The property is cleaned and prepared for guests on each changeover with all bed linen provided. Towels are available as an extra at £3 per set (please mention on booking). Electricity is charged by meter reading and deducted from the security deposit. Arrival for guests is 3pm. Departure is 10am. Normal changeover day Easter to the end of September is SUNDAY. This normally means less traffic and a smoother arrival for you. Current arrival treat: Fizz in the fridge! Idea location for touring the local area and cycling along the camel trail. Waterside is a pleasant house with everything you need for a break or family holiday. Would definitely recommend this property. We had a great stay here. It had all the things we needed. The place is clean and comfortable. The location is great as it is right on the edge of town but easy walk to shops etc. The camel trail comes past the front door so good for access. There is plenty of car parking spaces on the road and one private. Only negative point is that the second double bedroom did not have a full length bed. Thank you very much for your 5* Review. We are so glad you enjoyed your stay at Waterside and appreciated the facilities of the house and the handy location of the town and Camel Trail. Thank you also for your comment about the second double bed. We have had this under review for a while. Following measuring today we plan to order a full length King Size bed zip lock which will convert to 2 singles. We have just decorated the 2 downstairs bedrooms (new photos soon) and would be pleased to accommodate you again. We very much enjoyed our stay. The house was immaculately clean and tidy. Comfy beds, comfy sofa : an overall brilliant stay. The kitchen was well equity with everything we needed. We enjoyed the views from the balcony (whilst enjoying the bottle of fizz left for us). The house is in a good location, plenty of shops close by, and also central for exploring cornwall and Devon. We are already planning our next holiday here, highly recommended! Thank you for your 5* review which is much appreciated. We are delighted you enjoyed Waterside, the location and your stay. We look forward to accommodating you on your next visit to Cornwall. Waterside cottage is a must for anyone wanting a relaxing place to stay. so clean and well looked after with all the mod cons you will need. Bryan and Liz Hudd. stayed 17th to 21st Sept..
Clean and spacious, garden was a veritable sun trap. Ideally situated for visiting all the sights of Cornwall. We did have to do more cooking than anticipated as all the pubs stopped serving food at 3pm, nothing in the evening. The couple of places that were open in the evening were not our kind of menus. The sea air really knocked us out so be prepared for a few 'early nights'. The lovely sandy beach at Rock, the historic Daymer Bay the magnificent surfing beach at Polzeath and the delights of Padstow are all within a short 6 miles drive. Polzeath is a similar distance and with regular good surf offers excellent body boarding or surfing for beginners or professionals! Relax afterwards with a meal locally or a Cornish Ice Cream. A car is recommended but not essential. The bus service is good and previous guests have arrived by train (Bodmin Parkway nearest station) and used solely buses or flown to Newquay and used just buses to explore and have been very happy. There is a good Sea Life Centre in Newquay and the Extreme Academy at Watergate Bay offers adrenalin sports such as surfing or kite surfing. Culinary experiences abound in the area including the renowned Jamie Oliver 15 Restaurant at Watergate bay. Or perhaps enjoy Fish and Chips or a meal at one of Rick Steins famous eateries in Padstow. Tintagel with its legends of King Arthur is an easy morning trip. (All within 6-15 miles). 20 miles away, the Eden Project is not to be missed which offers regular special events including ice skating in the winter. 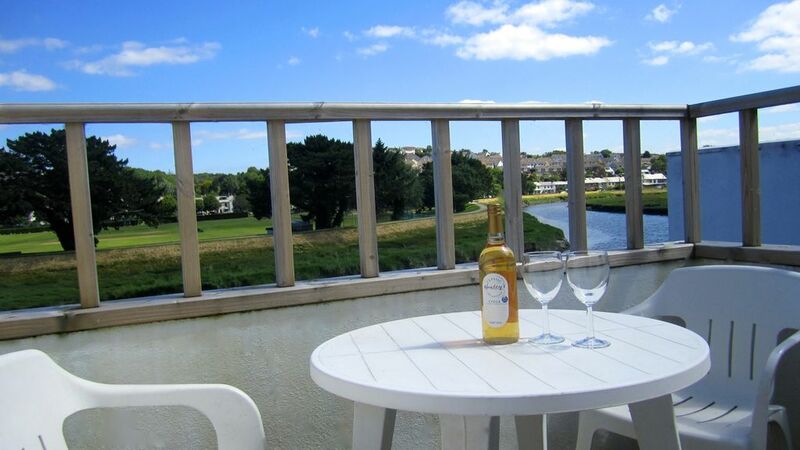 Wadebridge is an historic market town which was a busy river port in times gone by. There is a good variety of shops including a Supermarket within a quarter of a mile, a selection of pubs, restaurants and cafes and a leisure centre including a swimming pool and a cinema all within 1 mile. The latter has the latest films but old fashioned comfy seats and a very short walk home! Cornwall's rugged landscape, magnificent coastline, wooded creeks and historic mansions have been used by film and television companies for their productions and have inspired many pieces of literature. Poldark was extensively filmed in Cornwall. The James Bond blockbuster, Die Another Day starring Pierce Brosnan, was shot at Holywell Bay near Newquay and at the Eden Project. Saving Grace, was set on the north coast in Port Isaac, Boscastle and Trebarwith Strand. Continued success has also come with Doc Martin filmed at Port Isaac and Seaside Parish set in Boscastle. Daphne Du Maurier is famous for her many novels. The mansion Menabilly near Fowey featured in Rebecca is the Manderley of the novel. Inspiration for her novels include: Fowey; Helford River; Pendennis Castle and Jamaica Inn at Bolventor which you will probably pass on your journey to Waterside and the beautiful Lanhydrock house and woods also nearby. Lanhydrock also has fun off road cycle routes for all abilities and bikes can be hired there. Another novelist who associated with the Cornwall is Rosamunde Pilcher. Her books have been dramatised for television. One of her most famous books is The Shell Seekers and Coming Home which was filmed at Lelant, near St Ives, Prideaux Place Padstow and Marazion near St Michaels Mount. All of these charming locations are easily reached by car from Waterside. It would be incomplete not to mention Sir John Betjeman famous for his poetry. There is a small museum in Wadebridge just a few minutes walk from Waterside which displays some memorabilia. I thoroughly recommend a visit to his final resting place at Daymer Bay. The church was for many years covered in sand and the vicar had to enter through the roof! The beach is opposite Padstow and the views and sand are glorious. PLEASE NOTE: If you require other dates or durations which are not listed above then please enquire for a bespoke quote. Otherwise the computer may calculate a price based on staying a week in January and this may not be what you are seeking! Reservation Please reserve your holiday by email or instant booking. A booking form will be sent to you by email or post if you prefer. Please pay the deposit by credit card or BACS or return it with a cheque deposit of £100 to secure your holiday. The balance along with a £100 security deposit is due 10 weeks before your holiday begins. The security deposit will be returned by BACS or cheque following your holiday less electricity used by meter reading. Electricity is provided on a very economical tariff. Sorry strictly no pets. Changeover Day: Changeover day is Sunday because we find that this avoids guests having travel delays. We are happy to consider other changeover days in low season November - March. Arrival time is any time after 3 pm to suit guests. Departure time is 10am. Notes on prices: £20 discount for a couple occupying one bedroom. £50 discount for 2 or more concurrent weeks booked.